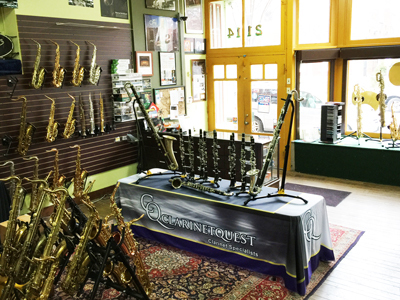 Clarinetquest is a high-end clarinet shop located within our Saxquest store in St. Louis, Missouri. Clarinetquest’s mission is to provide a full service repair shop, retail store front and comprehensive website all of which cater to the professional clarinetist and the advanced student. Whether serving a local customer or an online client looking for that "perfect" clarinet, we always go out of our way to provide a one-on-one experience to each individual. We understand that every player is unique and musical instruments are NOT one size fits all. At Clarinetquest, we are all musicians and we know how important it is to find just the right instrument or accessory and how that can take your musical experience to the next level. Clarinetquest and Saxquest employ a staff of 11 professionals. We are especially blessed to have a wonderful clarinet specialist on staff who is always available to help you with all of your clarinet needs. Audrey Denny is a Vandoren Regional Artist and has played professionally in orchestral, chamber and solo settings with such esteemed ensembles as the Chicago Symphony Orchestra. She’s our lead clarinet repair tech and play tester with many years of experience at the bench. Her work is used and respected by top-playing professionals all over the country. 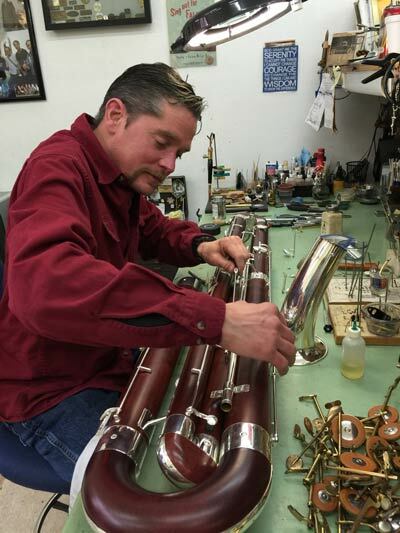 Rest assured that Mrs. Denny's background in playing, teaching and repairing will serve all of your clarinet needs. What makes Clarinetquest different from some of the other clarinet shops? Here at Clarinetquest, we are proud to be a Buffet Crampon, Selmer Paris and Yamaha dealer. We take pride in representing ALL of the major clarinet manufacturers from beginner to professional instruments. We’ve made it our business to know these instruments inside and out and can help you discern between different brands and models. We further distinguish ourselves by hand selecting all of our professional clarinets. If you’re looking for an instrument with certain playing characteristics we know how to find and select that instrument for you. We also offer a generous trial and exchange policy because we know that often times the first instrument that you try may not ultimately be “THE ONE”. At Clarinetquest we also know that not every customer can afford a brand new instrument. Therefore, we provide an array of refurbished clarinets that have been overhauled by Audrey. We also always welcome trade-ins. Clarinetquest thanks you for visiting our website and we sincerely hope that we can provide you with your next clarinet need! Do not hesitate to call or visit us in person, here in St. Louis, Missouri. Mark Overton is the owner of Clarinetquest and has had a lifelong love affair with music. Interestingly, he started his professional career as a research scientist, completing a PHD in Molecular Cell Biology in 2000. However, after two year of post-doctoral work his professional life turned towards music full time. Mark founded Saxquest in 2000 and likewise founded Clarinetquest in 2015. The vision behind both ventures was to create a space for single-reed instrumentalists to locate great equipment, share knowledge/learn about their instrument and engage in safe and honest transactions with a knowledgeable sales staff in both a brick & mortar retail store and over the Internet. This vision has led to the c reation of three ventures, a retail store front-repair shop at www.saxquest.com, a social media website for saxophone players at www.saxophone.org and a business dedicated to clarinetists at www.clarinetquest.com. Mark has been active in the St. Louis music scene since 1993 playing at various venues throughout St. Louis. He founded Code Blue, a Jazz Messengers style sextet and the Saxquest Nonet Jazz Orchestra which plays every second Tuesday of the month at the Tavern of Fine Arts. Mark has also served as an official music instrument appraiser for Antique Roadshow/Trash for Treasure events. Elke is a conductor and currently directs the wind symphony at Jefferson College in Hillsboro, Missouri and currently serves as vice president of Clarinetquest. She earned a Bachelor's degree in Music Education from the University of Northern Iowa in 1993 and completed her Master's in Instrumental Wind Conducting from the University of Cincinnati College Conservatory of Music (CCM) in 1997. Elke has also conducted the St. Charles County Community College (SCCCC) Orchestra and lead the SCCCC Jazz Ensemble. Elke is steeped in music education and teaches courses in Instrumental Conducting, Music Appreciation and Music History. She also volunteers her talents as adjudicator/clinician for several local high schools and colleges. Performance credits include stints with the St. Louis Philharmonic Orchestra, the Metropolitan Saxophone Ensemble, the St. Louis Wind Symphony and a variety of other St. Louis area classical and jazz groups. Jon Huff is our longest serving employee beginning his tenure here in 2004. Jon gives the title “Sales Manager” a whole new meaning as nothing would get done around here without him. Stocking our accessory and instrument inventory, managing our many consignment instruments, handling our daily sales and shipments, and always being quick and cheerful to answer the phone and reply to email gives only a small taste of the many tasks Jon undertakes on a daily basis. Jon received a Bachelor’s degree in Music from the University of Missouri St Louis in 2003 studying classical saxophone in the studio of Elke Overton. Jon finds great satisfaction every time he helps a player find their dream instrument. He’s very talented at being able to discern the needs of individual customers and match them up with the perfect instrument or mouthpiece that best fits their unique playing style. Zac Minor started with us in 2008 but prior to his working here he was a loyal customer purchasing his first professional instrument with us. Having been both an employee and a customer gives Zac a unique understanding that he can call upon when helping you find just the right equipment. Zac also serves as product tester and artist relations manager. He is very skillful diagnosing customer’s needs and coming up with optimal solutions. Zac received a Bachelor’s degree in music, Jazz Technology in 2011 where he studied saxophone with Paul DeMarinis, Willie Akins, and Leo Sagiugt. As an active professional musician in the greater St. Louis area, Zac has carved a niche for himself as a hard hitting R&B, Blues and Soul playing saxophonist. He plays tenor saxophone with Al Holiday and the East Side Rhythm Band but can often be heard with any number of different groups on a given weekend. 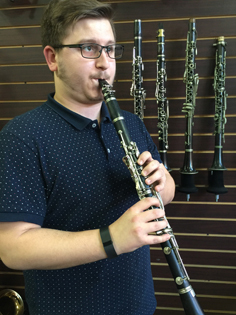 Nick Pyles is a classically trained saxophonist and clarinetist finishing his Bachelor’s degrees in Music Performance and Music Theory at Southern Illinois University Edwardsville. He Gigs as a multiple woodwind specialist around the St. Louis area playing musicals for different colleges, universities, and community organizations. Nick is a member of The National Flute Association, The International Clarinet Association, and The North American Saxophone Alliance, and actively attends events for each group. He is also one of the founding members of the St. Louis Saxophone Quartet. 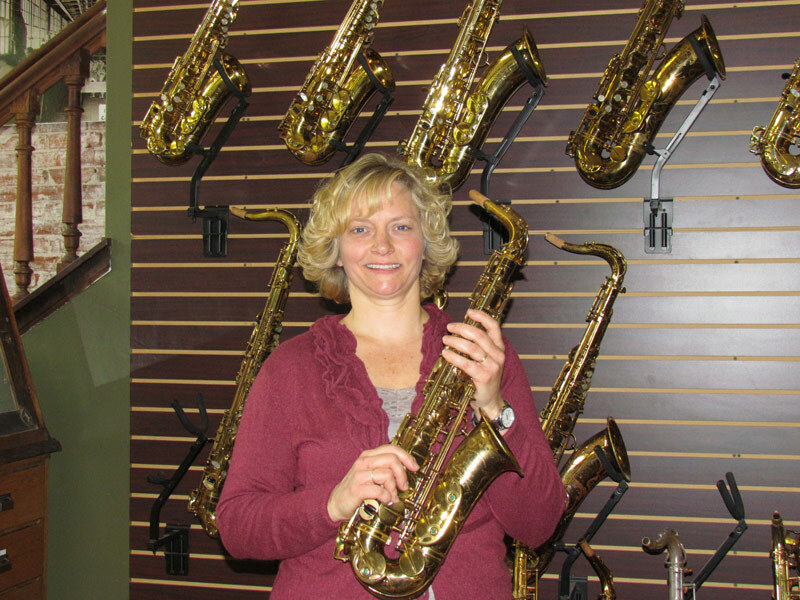 At Saxquest, he has a variety of roles from play-testing horns to helping customers choose their perfect instrument.